Drawing on the wisdom of 2,500 years of contemplative non-religious writing on all that it means to be human - from the origins of the universe to small matters of courtesy and kindness in everyday life - A. C. Grayling, Britain's most popular and widely read philosopher, has created a secular bible. 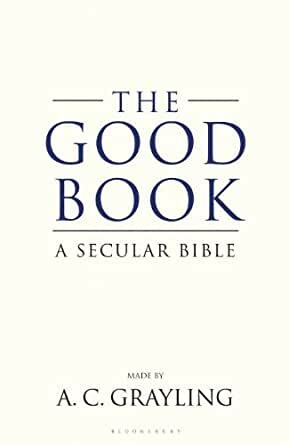 Designed to be read as narrative and also to be dipped into for inspiration, encouragement and consolation, The Good Book offers a thoughtful, non-religious alternative to the many people who do not follow one of the world's great religions. Instead, going back to traditions older than Christianity, and far richer and more various, including the non-theistic philosophical and literary schools of the great civilisations of both West and East, from the Greek philosophy of classical antiquity and its contemporaneous Confucian, Mencian and Mohist schools in China, down through classical Rome, the flourishing of Indian and Arab worlds, the European Renaissance and Enlightenment, the worldwide scientific discoveries of the 19th and 20th centuries to the present, Grayling collects, edits, rearranges and organises the collective secular wisdom of the world in one highly readable volume. The Good Book, A. C. Grayling's best-selling secular bible, is now published in a handsome, smaller format hardback at a competitive price. I bought this book with no expectations. I had read an article about it, as an atheist I liked the idea and wanted to support Grayling's work so I bought it. I really was pleasantly surprised. This book is not a compilation of work. You will not open it up and find passages from various works called out by author. It is truly written in the style of the Bible - Grayling has taken the collected wisdom of hundreds of secular philosophers and melded it together in the flowery prose form typical of the Bible. There is no reference list at the back to tell you where anything came from, he has taken the ideas and the texts and melted them together. The Good Book begins with Genesis, where you can see the ideas of Darwin laid out in an inspirational way. Reading through this I was really pleasantly surprised at how much I liked it. I'm used to this language being peppered with things I don't believe in, and listening to it at weddings or funerals generally gives me a lump in my stomach. Here was the same kind of lofty language, but saying the things I believed! I didn't realize how much I would enjoy hearing Darwin's theory of evolution told as a beautiful story of how we began and the cycle of life. As you make your way though the book, you can clearly see where he has incorporated Plato's dialogs, but without specific references. Characters are mentioned in the same way as the Bible, introduced without preamble, just snippets of conversation or story which attempt to showcase an idea. There are passages on grief and death as well. If you are looking to learn the works of these philosophers in an intellectual way, this is not the book for you. This book is meant to absorb the ideas they upheld in a more spiritual feeling way. I wish this book had been published before I got married, I would have looked for a passage from it to read at my wedding. I could see reading it at a funeral, there really is something cathartic about having grief and death and moving on with life written in this way. I feel in some ways as an Atheist this may have been what I was missing and didn't realize it. I didn't have anything to help me find a way to feel good about my place in nature's greater story, I just felt the absence of the belief in an afterlife. I also feel like this is a book I could read to my kids to help them figure out how to be a good person in a world which is not always good and in which you cannot rely on a all powerful being to save you from your problems. The language is flowery and poetic, but its also much more accessible than say Kant's Metaphysics of Morals. I minored in philosophy in college, I'm by no means an expert, but I have read some of these works and they are by no means easy to absorb. So, I think for what this book is trying to accomplish, what it says it is in the description, it is a great work. 499 people found this helpful. There are a lot of reviews on here less than 5 stars. Carefully read some before you pass this book over. A.C. Grayling has produced a timeless work worthy of the highest esteem. Some descriptions make this sound like an anthology, a refutation of the bible, or worse. It is none of the above. It is painstakingly crafted, beautifully laid out on the page, and an immense volume that you will enjoy for a long time. I found myself pondering passages carefully. They are written in beautiful prose sometimes and clever rhymes at others. There are quotes within quotes within stories told be sages, and voices from unknown and unidentifiable speakers. Others say dense, I say full of subtleties. Others say hard to read, I say filled with english of the highest degree. Others say devoid of references, I say the knowledge is timeless. Do not delve into this looking to have atheistic beliefs reinforced, passages by ancient authors quoted, summarized, and referenced, or to have science presented as a refutation to the biblical history of the world. This is a work that should be taken wholly unto itself. Enjoy. 4.0 out of 5 starsIts a Good Book! The most important thing about this book is you don’t have to be a secularist to appreciate the wisdom within. This book contains exactly what it is titled, an immense amount of philosophical, historical and ethical prose, and writings from many of the greatest minds that have existed with humanity. Now don't get me wrong, you aren’t going to find every word within deeply inspiring or for that matter helpful, but this is not a book that should really be read cover to cover in one sitting, though it can be, but a book which should be read a little, flipped through and digested for in my opinion, probably many years to even a life time. This is a book that I keep on the edge of my desk, and find myself, when I am pondering on situations in my life, or perhaps lost in thought on some random path. I will pick the book up and flip to a "book" which I feel may help give a little bit of insight into this thought. Overall, this is a wonderful book, the only complaint I have is it would have been nice to have even just had endnotes or a little more direction as to whom was the writer of passages, but in the long run, with the advent of Google now-a-days, it’s easy to type in a phrase and pretty quickly find this. Really appreciating the poetic way in which this book is written, I think it will encourage all of us to speak and write more eloquently. 5.0 out of 5 starsThis was my “holy book” during Army BCT. It lived up to its name. I read it each night by red G.I. flashlight.